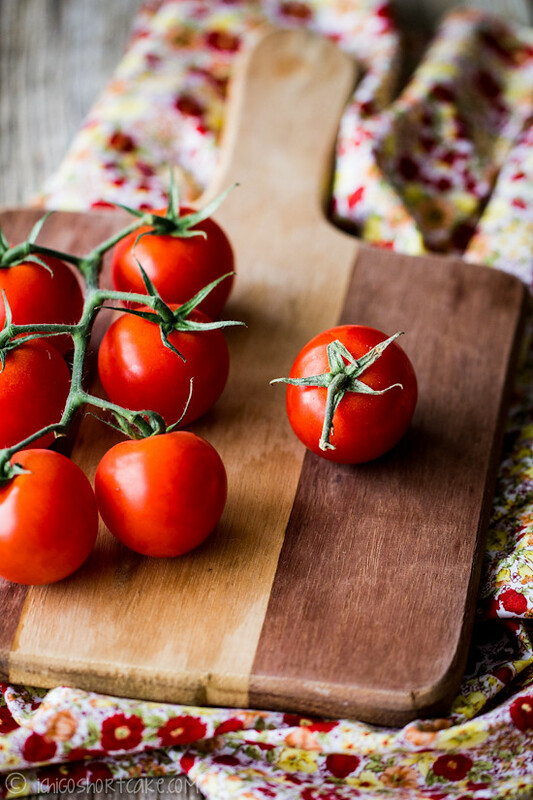 Since we just had Thanksgiving, let’s stick with the food theme and kick off the week with these tasty morsels. Jenny, from Ichigo Shortcake, first shared her decadent 2-Minute Chocolate Nutella Cake with us. 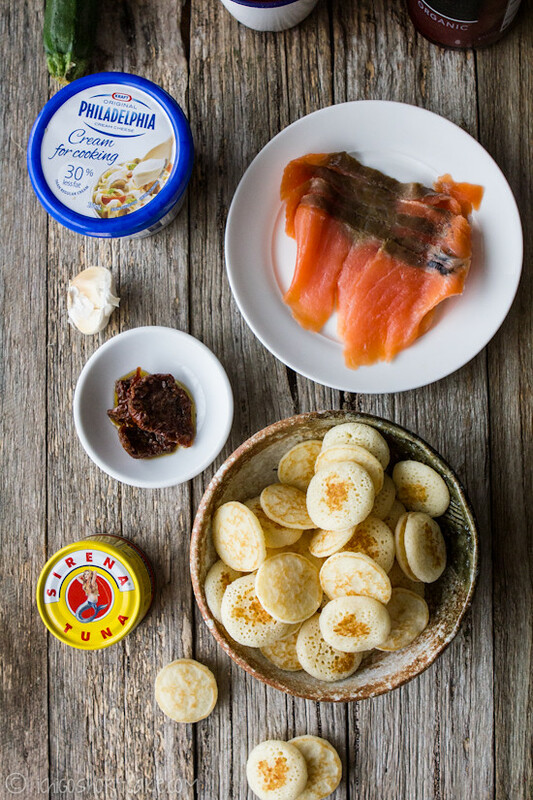 Now, she’s back to show you how to turn mini pancakes (aka blinis) into tiny flavor explosions. 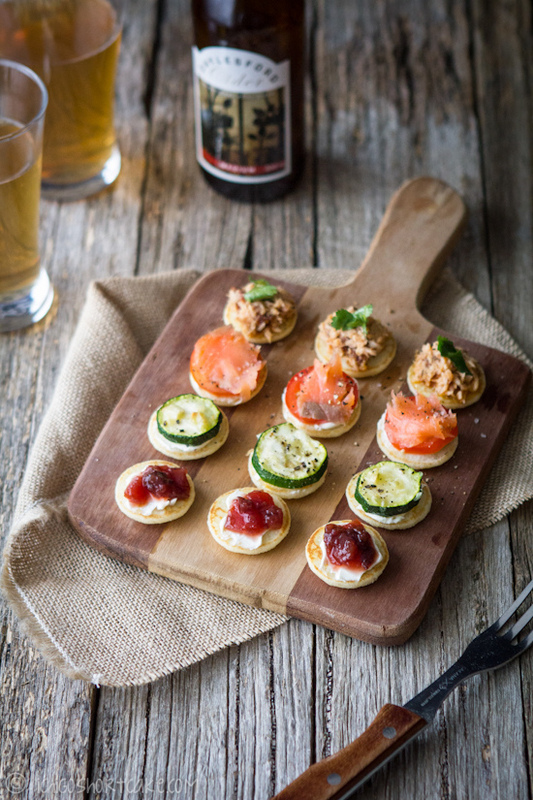 You might want to jot this down for a holiday party appetizer. Don’t forget to check out her other holiday recipes like, Chocolate and Blueberry Mousse and the Pimm’s Cup with a Gingery Twist holiday cocktail. For some reason my mum bought this big pack of mini pancakes from Costco but realised no one was going to eat them at home and I have a habit of not being able to refuse food when it’s offered to me. So, as a result, Yuye and I had these pancake bites for 2 meals last week. There are so many names for thin batter cakes – pancakes, pikelets, crumpets, blinis, crepes…did I miss any? The packaging said they were blinis but I thought they were more like mini pancakes which is what I called them. They are perfect as party food or as an afternoon snack (or as a meal if you had that many to finish like me). They are also so versatile that you can practically put anything on them whether it be sweet or savoury. I just used whatever I had in the fridge. 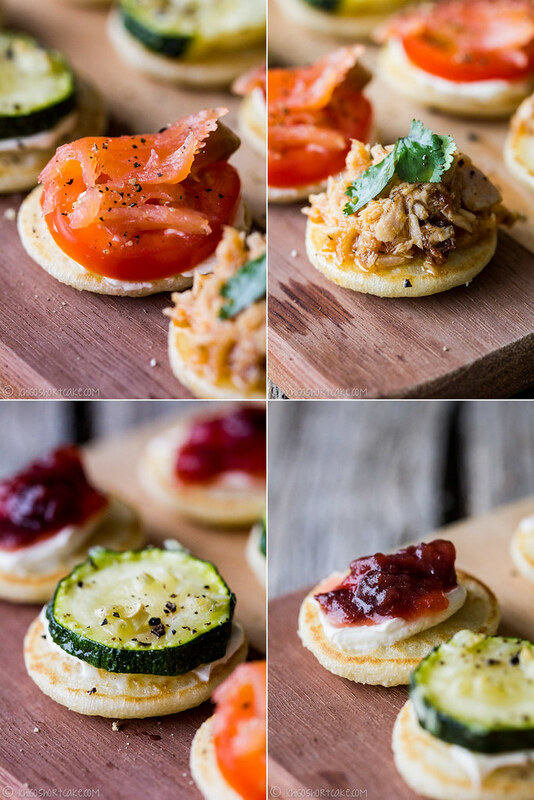 When I realised the cherry tomatoes and zucchini pieces fit perfectly on the mini pancakes I grinned from ear to ear. I was like a child who had just realised the triangle piece from the toy set actually fit into the triangular hole and I was putting more on the pancake just so I could grin some more. I know, the smallest things amuse me. 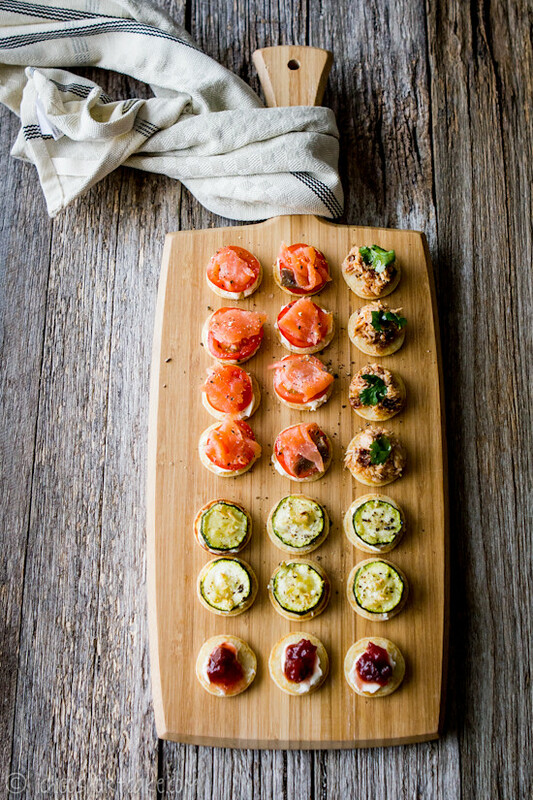 I enjoyed these bites with a glass of apple cider I purchased from my recent Daylesford trip. 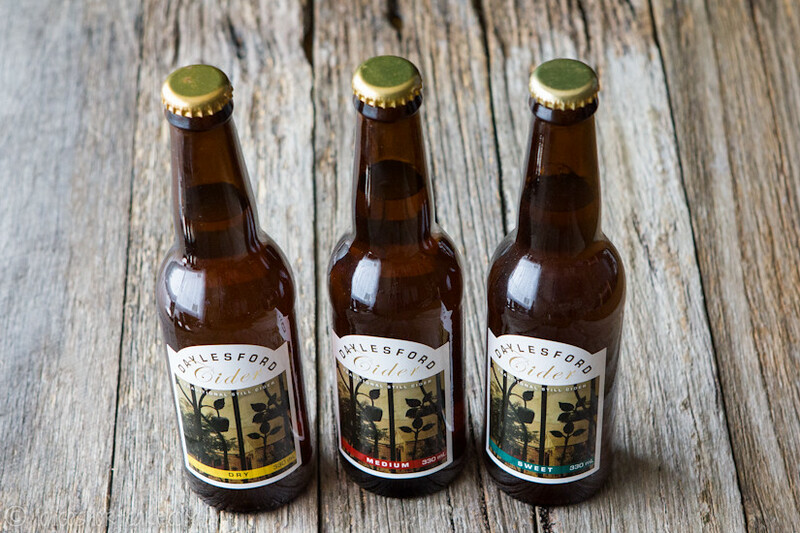 These are non-fizzy which make them very easy to drink and they’re not as sweet as most ciders. 2. Assemble onto mini pancake. If you used tuna in chilli oil, pour some chilli oil on top or can top with chilli flakes, else top with some olive oil so it’s not as dry. 1. Preheat oven to 200C. Top zucchini pieces with oil, chopped garlic, salt and pepper then bake for roughly 10-15 minutes or until cooked through. 2. Assemble with cream cheese zucchini and then season with salt and pepper if necessary. 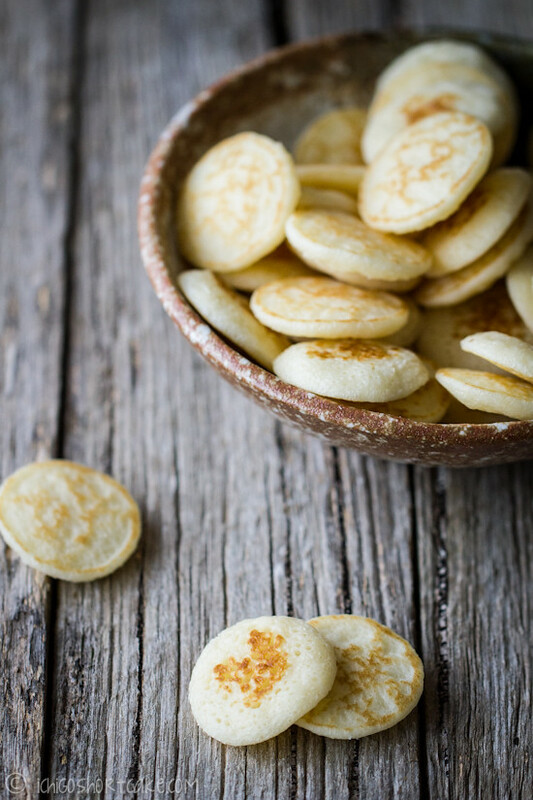 Question time: What topping would you have with these mini pancake bites? i’m going to try the smoked salmon, tuna and caramelized onions. can’t wait to try them! these are to DIE! they are adorable, and look delicious to boot! thanks for sharing! So, I take it these can be made ahead and don’t have to be kept warm.